I love to share amazing recipes I find that I consider 5-star and this recipe for Roman-Style Chicken from Giada De Laurentiis is outstanding! It's one of her top-rated recipes on Food Network and once you make it, you'll understand why. Relatively easy and quick to make, it's a crowd pleaser! This is one of those dishes I can't make for my husband as he doesn't like peppers, but I make it every chance I get for my girlfriends and family. I've never made it with fresh peppers as the recipe calls for. Instead, I use a jar of yellow and red roasted peppers I buy at Trader Joe's and it cuts down some time in preparation and I love the flavor. I usually serve it over quinoa as it really soaks up the wonderful sauce. To see Giada's recipe, click here. 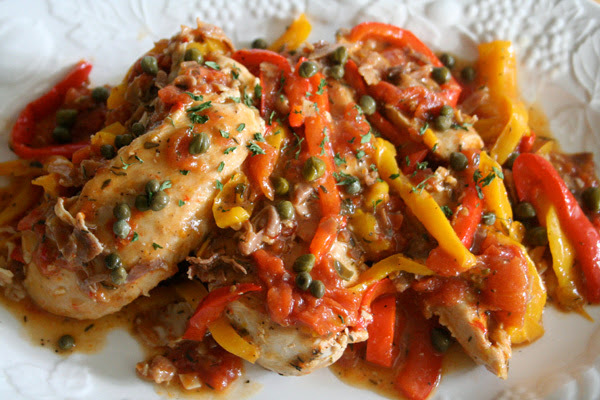 Also, check out my post for Chicken Marbella for another 5-star chicken recipe!